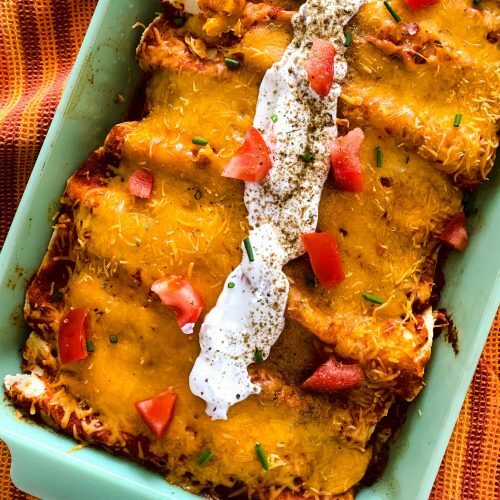 These Cheesy Chicken Enchiladas are absolutely fantastic. Perfect when you want to celebrate with a little Mexican food (and Margarita) any day of the week! This recipe is quick and tasty and would be a festive addition to your Cinco de Mayo celebration. 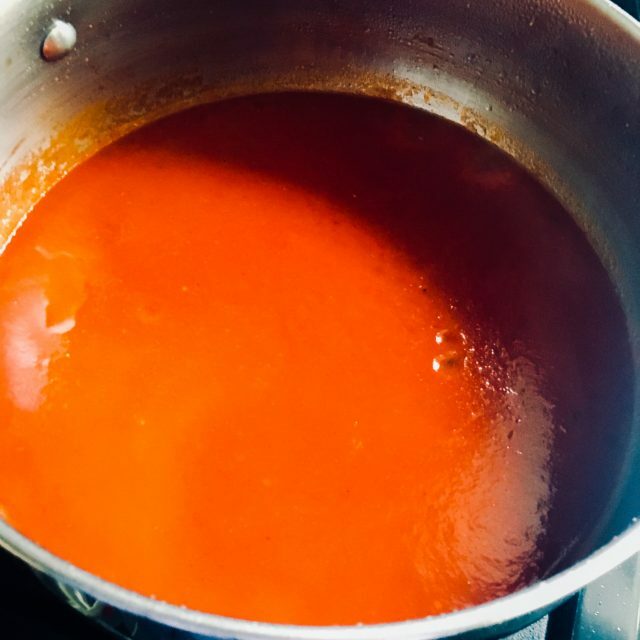 For the enchiladas sauce you can double the recipe and freeze a batch to have it readily available the next time you want them. This recipe is quick and tasty and would be a festive addition to your Cinco de Mayo celebration. For the chicken, feel free to buy a rotisserie chicken, but it’s so easy to make Slow Cooker Shredded Chicken. Throw some chicken in a slow cooker with some broth, sauce and spices and the chicken will shred easily. You’ll also be able to use extra Slow Cooker Shredded Chicken for other meals that week or store some in it’s broth in the freezer for future meals. 1/2 cup of shredded chicken rolled into the tortilla and placed seam down in the pan. 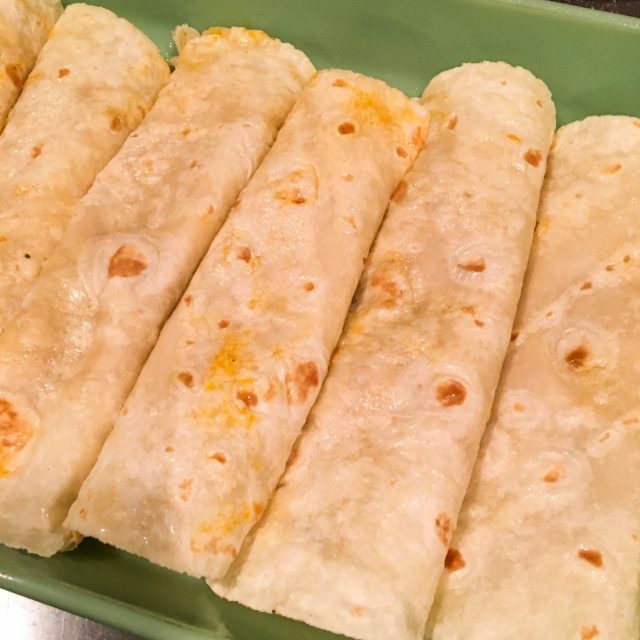 Top with enchilada sauce and cheese and cover with some foil and stick them in the oven. You can cut calories by using plain greek yogurt instead of sour cream but if you’d like to add your favorite toppings such as guacamole, hot peppers, cilantro or scallions, that’s up to your taste. Go for it! 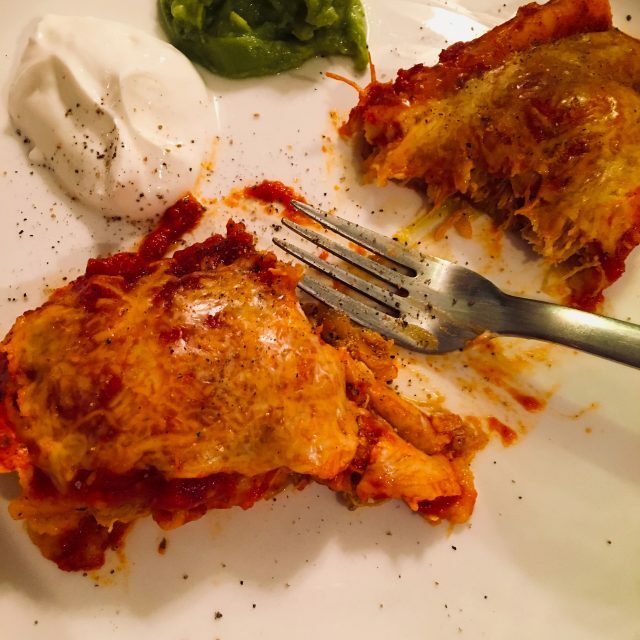 With the option to buy gluten-free tortillas, this has become one of my favorite go-to dishes to make and it holds in the refrigerator for a couple days for some tasty leftovers. 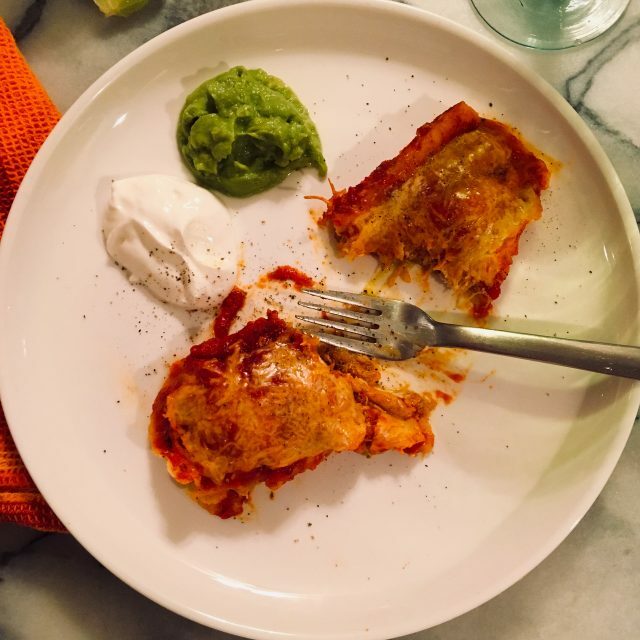 These Cheesy Chicken Enchiladas are very filling and you really only need one per person. It’s a great recipe to make for a group. I hope you enjoy these as much as my family and I do. Everyone needs a fiesta in their daily lives. This tasty dish will surely help the cause. Add chipotle chiles, chili powder, cumin, chicken broth, tomato sauce, salt and pepper. Bring to a boil. Set aside sauce until ready to use. Preheat oven to 400 degrees. 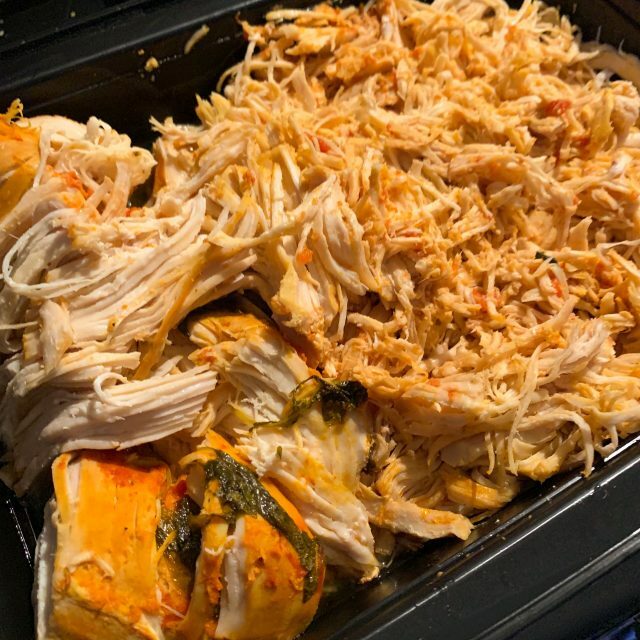 Follow recipe for Slow Cooker Shredded Chicken. Pull chicken from a rotisserie chicken and place in a bowl. Heat the vegetable oil in a skillet over medium-high heat. Sauté garlic on low until soft, about 2 minutes. Add chicken, adobo, chili powder, cumin, salt, tomato sauce, chicken broth, and cook 4 to 5 minutes. Add 1/2 cup chicken into each tortilla and roll it. Top with sauce and then top with shredded cheese. Top with your favorite toppings such as plain greek yogurt, sour cream, avocado slices, guacamole, fresh tomatoes, scallions, cilantro.